A few weeks ago, Ryan and I took a long weekend off for a Colorado getaway. We’ve wanted to take a road trip for a while and when I discovered this secluded little cabin on Airbnb, just 10 hours away from Dallas, we knew it was the perfect opportunity to get away. The best part? The cabin was pet friendly so Memphis got to tag along! He's a great car traveler, even for long distances, so we loaded him up and he spent most of the drive just laying down in the back seat. Apparently there's a Memphis, TEXAS - who knew!? We each ordered a drink when we sat down - a margarita for me and a beer for Ryan - and mine came with a huge jalapeño and a Texas flag. So much fun! If you’re a Man v. Food fan, (or if you’ve ever driven within 3 hours of Amarillo and noticed literally ANY of the billboards) you’re probably familiar with the 72 oz. steak challenge. Yep, this is the home of that outrageous feat. No one was attempting it while we were there, but that didn’t make the restaurant any less entertaining. It was super touristy but Texan through and through! After we ate lunch, we headed to the famous Cadillac Ranch. It's right outside of Amarillo and just what you’d expect – 10 Cadillacs buried in the middle of a pasture! We had a great time taking pictures despite the crazy wind, and Ryan brought along some spray paint to tag one of the cars. If you’re passing through Amarillo, it’s worth a stop for a few pictures, and it’s literally right off the interstate. At the time we were there, only two other people were out walking around so it's a great place to stop and stretch your legs, and see a cool landmark at the same time. After you get outside of Amarillo, there’s… not much else. Ok, there’s nothing, y’all. The scenery is minimal and it is WINDY. After lunch it was my turn to drive – we switch out every few hours – and it was a two-hands-on-the-wheel-at-all-times kind of situation. We started to get hungry for dinner just as we made it into Colorado. It was already getting late, and we knew we’d be unpacking in the dark anyway, so we decided to make an actual stop for dinner instead of just grabbing something quick on the side of the road. 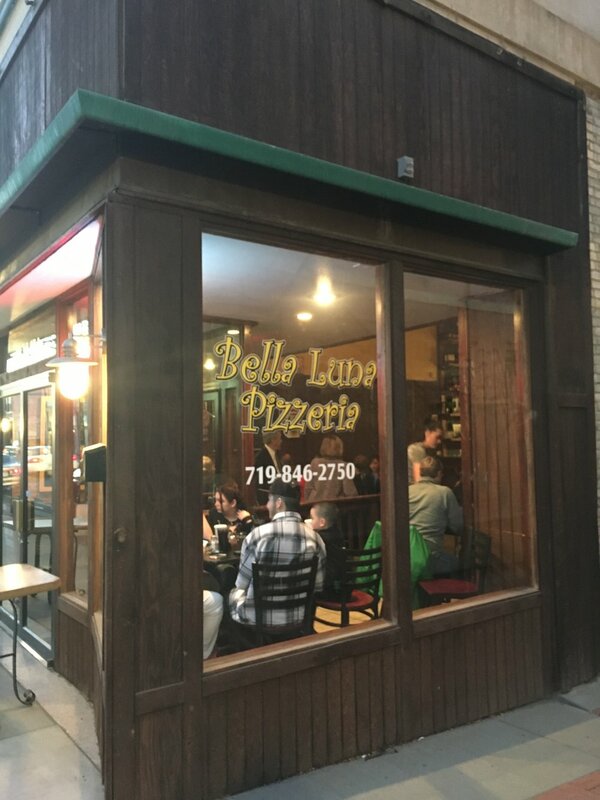 Ryan was crazing pizza, and a quick search led us to Bella Luna Pizzeria in Trinidad, CO. We were really just hoping for better-than-fast-food, but this turned out to be one of the highlights of the trip! The pizza was fantastic and you can’t beat the cute little main street where the restaurant is located. Are #mainstreetgoals a thing? Because Trinidad is killing it. My quick phone pictures don’t do it justice, but it’s super, super cute and worth a stop for dinner if you’re ever passing through! After dinner, we had about an hour and a half of driving left. It was totally dark, so no more pictures from that night, but we woke up to beautiful Colorado scenery and SNOW! Stay tuned for part two of our trip (hopefully tomorrow!) including our time in Beulah Valley. Happy Wednesday!